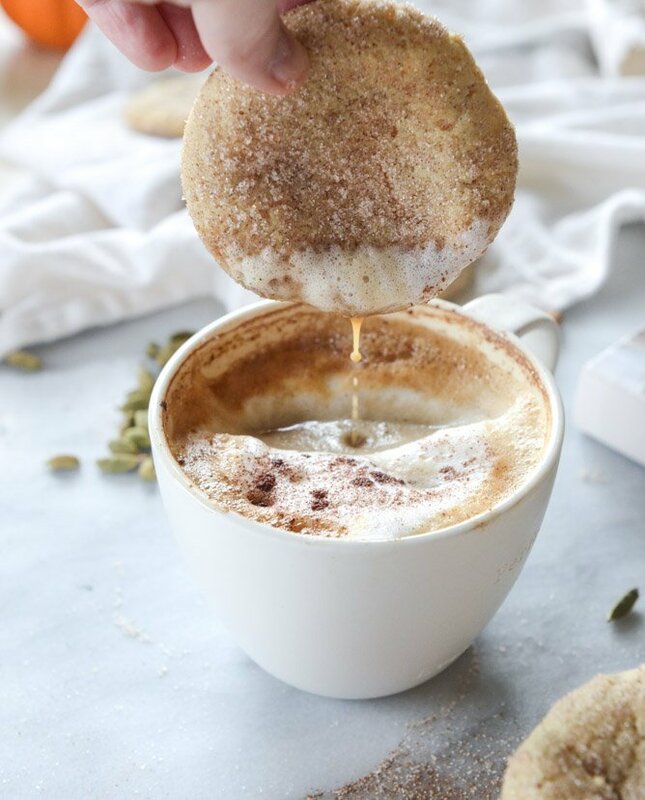 What if… the current universe was comprised of all chai spiced things instead of pumpkin spiced things? I could get behind it. I most definitely could. 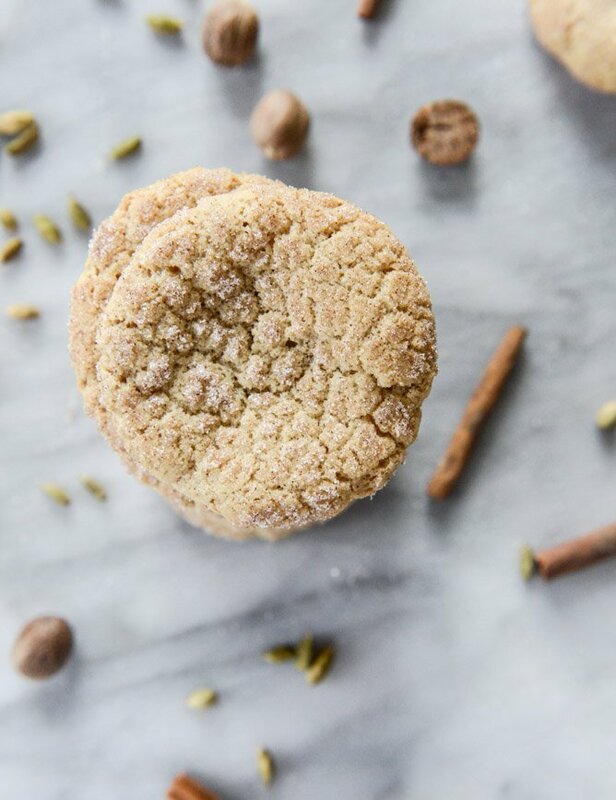 Which is huge, because I didn’t realize how much I absolutely love chai spiced things until I ate chai spiced snickerdoodles. Very, very good day. 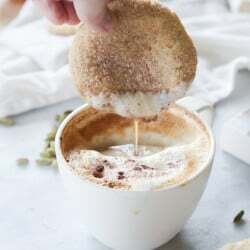 Also, as a sidebar, you need to know that I can’t even say “chai tea” without first calling it “tai chi” because this one time, my mom went on and on and on (and ON) about what a delicious “tai chi latte” she had. Yep. I seriously wish you could have been there. Eeeeek. 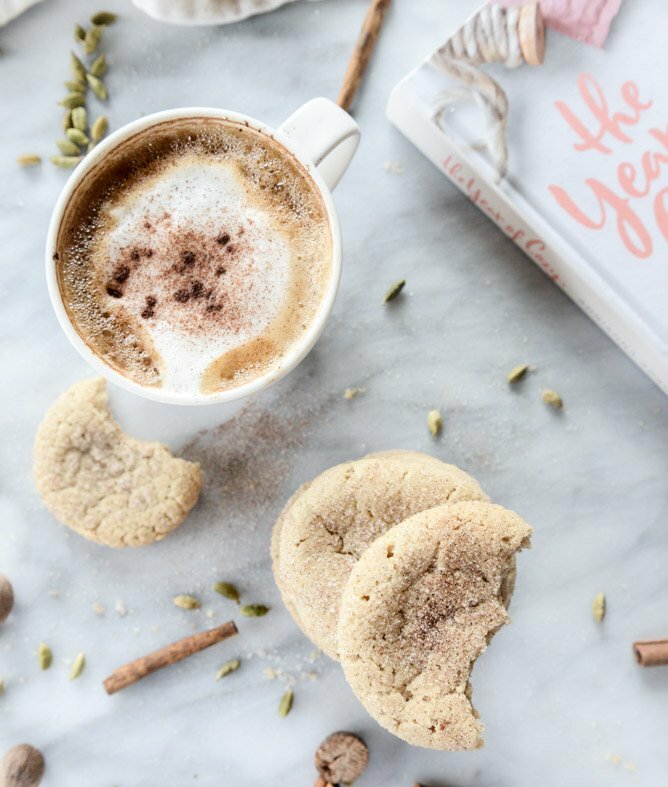 I am so excited to ramble about these cookies today because 1. they taste absolutely FANTASTIC, 2. they are perfect for this season with all their warm flavors and what not and 3. they come from my friend Adrianna’s new book, The Year of Cozy. The Year of Cozy. Just how… COZY… is that name?! It makes me want to wrap myself up in one of those million dollar blankets from Restoration Hardware and sit by a fire while burning my basic Leaves candle (tell me it isn’t the best) and sipping something hot and chocolatey and spicy. This is why I love her book so much, because it’s so HER. Guys, this isn’t just a cookbook! It has crafts and seasonal ideas and DIY gifts and stuff. Things that you can do even if you weren’t born with a crafty bone in your body, aside from being able to dump glitter on things. So in short, I can’t stop devouring her book and even better, it’s so PRETTY that it has a permanent space on my desk right this minute. My desk being the kitchen table, but you know. Details. The cookies are a downright dream. 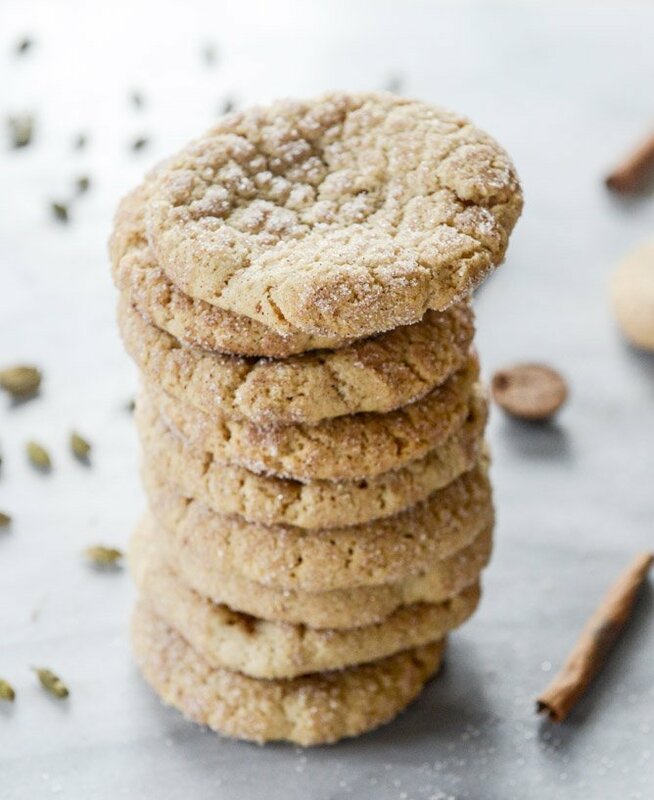 They are spicy and cinnamony and really, a high class snickerdoodle. 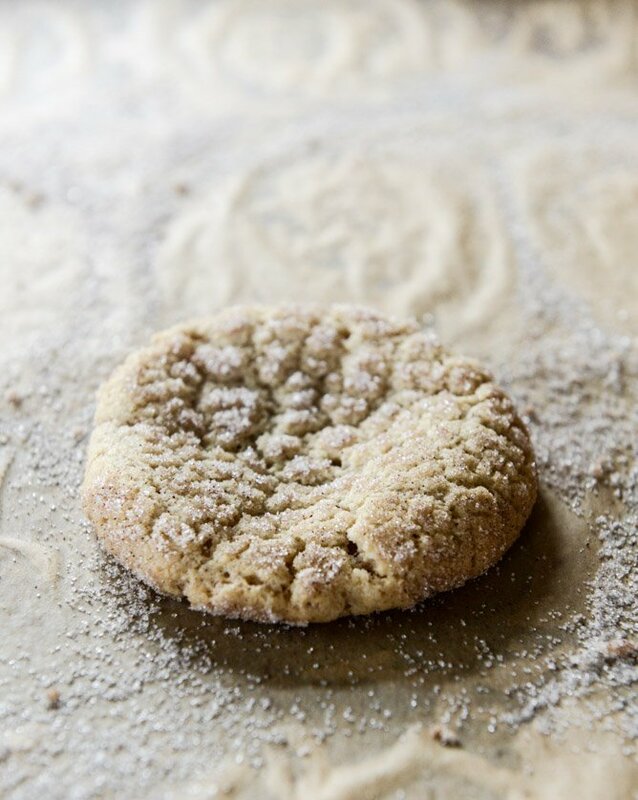 A classy snickerdoodle. Definitely not a trashy snickerdoodle. The have a slight crunch on the outside and a soft and chewy inside which is EXACTLY how I like my cookies. No really, I’m trying to figure out how Adrianna got inside my brain because these cookies speak to me. And they somehow get even better when dipped in coffee. I still think I’m a coffee gal over a chai tea gal, especially if I can have my chai in my cookies. I love how this is working out. 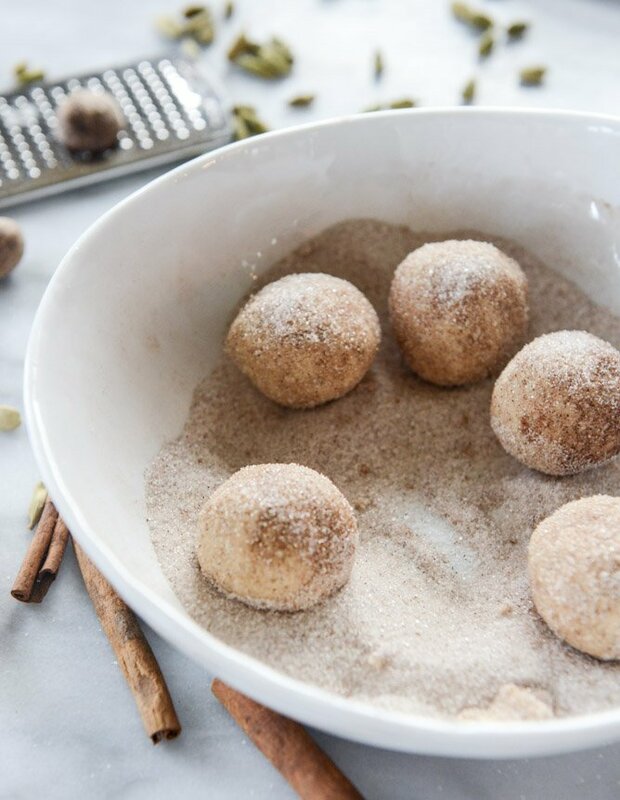 In a bowl, whisk together the flour, baking powder, soda, salt, ginger, cinnamon, cardamom, cloves, allspice and pepper. In the bowl of your electric mixer, add the sugar, cream cheese and butter. Beat until light and fluffy, 1 to 2 minutes. Beat in the oil until combined. Add the egg, milk and vanilla extract untiled combined and smooth. Add the flour in two additions, scraping down the sides if needed and beating until just combined. 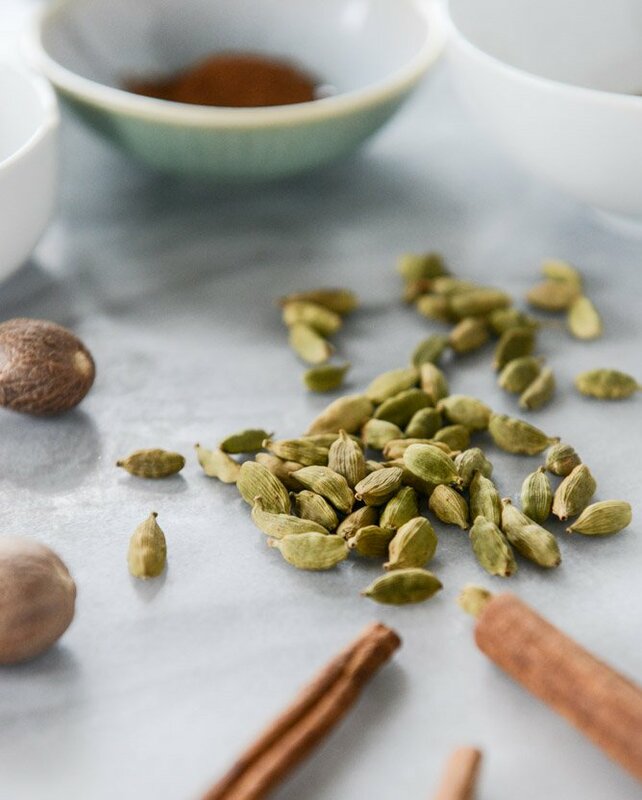 Mix together the topping ingredients (sugar, cinnamon, cardamom) on/in a large plate or bowl. Take the cookie dough and divide it into 24 equal pieces, rolling each into a smooth ball. Roll each ball in the topping and place it on a baking sheet, keeping the cookies about 2 inches apart. Use the bottom of a drinking glass to gently press the cookie balls into flattened pieces of dough. 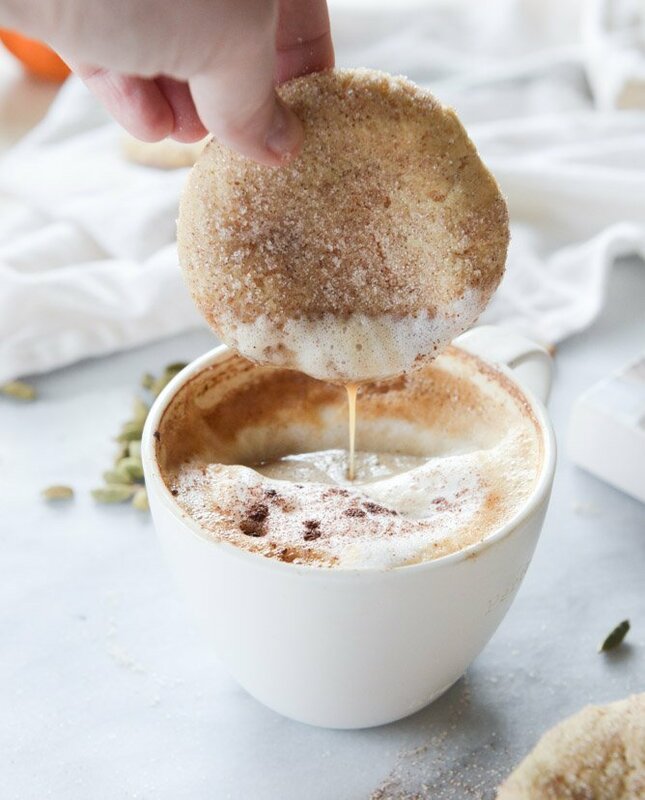 Sprinkle the tops with any extra cinnamon sugar mixture. Bake the cookies for 11 to 12 minutes, turning once during cook time. Let the cookies cool for 5 minutes, then transfer to a wire rack to completely cool before serving. your weekend plans! right there. Pingback: The Good Life Blog | Christmas Beauty or Christmas Trash? I don’t have an electric mixer. Should I try it by hand, or can I use my immersion blender?? I’m not much of a baker but I want to try these! Thanks so much for this recipe! I’m actually not usually a big fan of snickerdoodles (I find them kind of boring), but they’re one of my boyfriend’s favorites. It turns out spices are just what they needed! And they got two thumbs up from the bf. Mine do look somewhat different from yours. The dough wasn’t as firm as normal cookie dough, and the cookies spread out a lot, ending up flat and chewy. I chilled the second tray for 20 minutes before baking, which seemed to firm up the dough a bit but the cookies are still quite flat. Yours look so thick and fluffy! Do you have any tips? Maybe the melted butter needed to cool more before mixing it with the other ingredients? These cookies taste DELICIOUS. So good! And I have a question, when you say “turn” the cookies halfway through cooking, do you mean to turn the baking tray in the oven? Or to flip the cookies? I tried flipping them and it wasn’t pretty, so I’d love some clarification :) Thanks! These classy snickerdoodles just came out of the oven. Oh my goodness, they are heavenly! They came out perfect & so pretty! I did chill the dough 20 minutes before baking.